Traditional well logging methods, such as resistivity, acoustic, nuclear and NMR, provide indirect information related to fluid and formation properties. The “formation tester,” offered in wireline and MWD/LWD operations, is different. It collects actual downhole fluid samples for surface analysis, and through pressure transient analysis, provides direct measurements for pore pressure, mobility, permeability and anisotropy. These are vital to real-time drilling safety, geosteering, hydraulic fracturing and economic analysis. Methods for formation testing analysis, while commercially important and accounting for a substantial part of service company profits, however, are shrouded in secrecy. Unfortunately, many are poorly constructed, and because details are not available, industry researchers are not able to improve upon them. 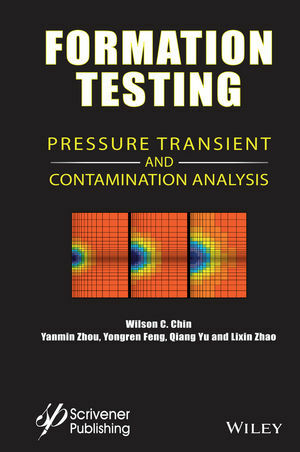 This new book explains conventional models and develops new, more powerful algorithms for early-time analysis, and importantly, addresses a critical area in sampling related to “time required to pump clean samples” using rigorous multiphase flow techniques. All of the methods are explained in complete detail. Equations are offered for users to incorporate in their own models, but convenient, easy-to-use software is available for those needing immediate answers. The leading author is a well known petrophysicist, with hands-on experience at Schlumberger, Halliburton, BP Exploration and other companies. His work is used commercially at major oil service companies, and important extensions to his formation testing models have been supported by prestigious grants from the United States Department of Energy. His new collaboration with China National Offshore Oil Corporation marks an important turning point, where advanced simulation models and hardware are evolving side-by-side to define a new generation of formation testing logging instruments. The present book provides more than formulations and solutions: it offers a close look at formation tester development “behind the scenes,” as the China National Offshore Oil Corporation opens up its research, engineering and manufacturing facilities through a collection of interesting photographs to show how formation testing tools are developed from start to finish. Wilson C. Chin, who earned his PhD from MIT and MSc from Caltech, heads StrataMagnetic Software, LLC in Houston, which develops mathematical modeling software for formation testing, MWD telemetry, borehole electromagnetics, well logging, reservoir engineering, and managed pressure drilling. He is the author of ten books, more than 100 papers, and over forty patents. Yanmin Zhou received her PhD in geological resources engineering from the University of Petroleum, Beijing, and serves as Geophysics Engineer at the China National Offshore Oil Corporation. Yongren Feng is Chief Mechanical Engineer at the China National Offshore Oil Corporation with three decades of design experience covering a dozen logging tools. With more than 100 patents, he serves as Project Leader for the 12th National Five Year Plan in formation tester development, and he was elected as one of China’s National Technology and Innovation Leaders. Qiang Yu earned his MSc in measurement technology and instrumentation from Xi’an Shiyou University and serves as Senior Control Engineer in formation testing and field operations. He is an Associate Project Leader in the national formation testing program with the China National Offshore Oil Corporation. Lixin Zhao earned his PhD from the University of Petroleum, Beijing, and serves as Senior Petrophysical Scientist, with three decades of logging and formation evaluation experience.